On Friday night, Rabbi Eli Backman and his family opened their home for Jewish students to enjoy a free Shabbat dinner. Although the Backman family hosts Shabbat dinners weekly, their house was particularly crowded this past week. Chinese cuisine may not be considered exactly typical fare for a Shabbat meal, but the annual Chinese Chabad dinner has been a well-loved tradition among Jewish students at this university for well over a decade. The Backman’s house was filled with the aroma of fried noodles and spices. Throughout the meal, student volunteers hoisting platters piled with walnut chicken and rice marched around the dining room, socializing with the attendees and ensuring they were well fed. “It’s great, but mostly because I enjoy the company,” said senior history major Ben Sonnenberg. Chabad takes great pride in the fact that their Shabbat dinners are entirely homemade. Although the rabbi asserts that his wife is the force behind the Shabbat dinners, she is not entirely without help each week. Tables are set and candles are lit prior to Shabbat dinner. Photo courtesy of Eli Backman. The Backman household was a maze of tables on Friday, all of which were crowded with students. However, Chabad Shabbat dinners were not always so well attended. At first, only a handful of people dined with the Backman family. Backman said the size of the weekly gathering grew gradually. 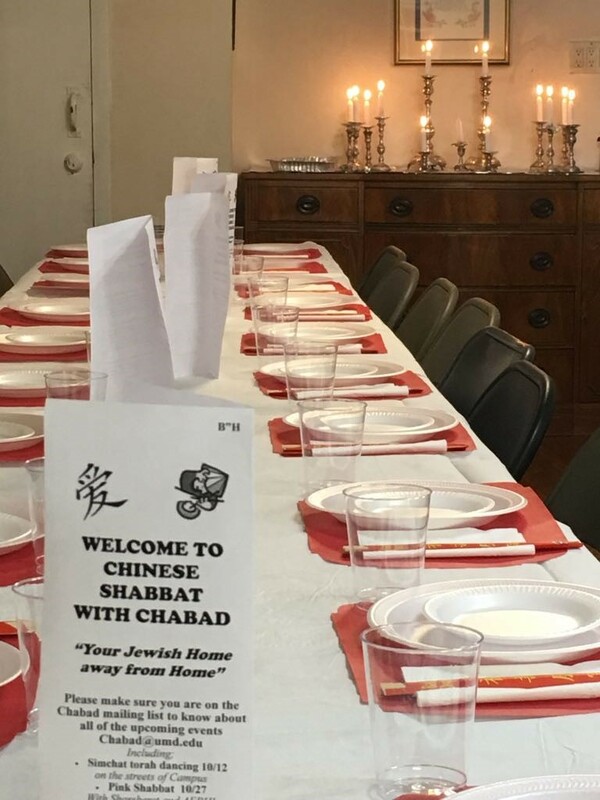 When Chabad first premiered its now annual Chinese Shabbat Dinner, the Backman family was unsure whether it would be a hit among students. No matter the type of food provided, Backman hopes that the Chabad Shabbat dinners will continue to provide a place for students to feel at home. No Replies to "Chabad kicks off semester with Chinese Shabbat dinner"